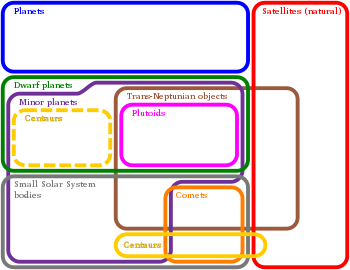 Euler diagram shawin the teeps o bouks in the Solar Seestem. A plutoid or ice dwarf is a trans-Neptunian dwarf planet, i.e. a bouk orbitin ayond Neptune that is massive enough tae be roondit in shape. The term plutoid wis adoptit bi the Internaitional Astronomical Union (IAU) wirkin group Committee on Small Bodies Nomenclature, but wis rejectit bi the IAU wirkin group Planetary System Nomenclature. The term plutoid isna widely uised bi astronomers, tho ice dwarf isna uncommon. This page wis last eeditit on 25 August 2016, at 20:13.